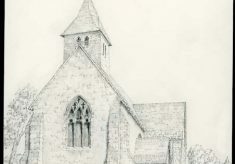 Original drawing by John Clark of the church of St. Mary and All Saints in Dunsfold. The drawing shows the side elevation with the graveyard in the foreground and trees in the background. Pencil on cream drawing paper.